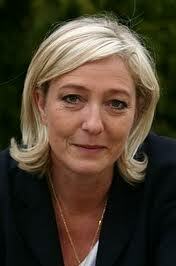 Where Waits Our Own Miss Le Pen, Where Waits Our Own Golden Dawn? I lament that this fascist Golden Dawn business is no surprise and will not stay put in Greece either. While the conventional news services in the West carry the oh so really big news of a dimwitted socialist coming to power in France and other blows against austerity measures in Europe, the news services miss the real point of these elections. That point is the inevitable advance of Fascist movements as the West slowly, but very pointedly, falls apart. In France for instance, the only news of consequence was the remarkable showing of young Miss Le Pen, who, licks her lips in anticipation at watching the hapless establishment parties attempt to make all OK that which can never again be all OK under their hapless governments. Having reached full 60 and lived officially all those years at Washington observing this circus, I have come in the last few years to think that we in US are likely living in what is our own, impotent, Weimar Republic. When the history of this time is later written of the horrid silliness of, what is, likely, our last oh so terribly important Presidential election pitting two, haplessly weak, men against one another as they attempt to garner faux power and make all OK a nation of people so terminally wounded by the endless financial calamities of the past decade that they have become utterly without trust in the established order, it will be apparent to anyone that we had our own Miss Le Pen or a Golden Dawn licking lips in anticipation of taking real power when the dam shortly breaks. It can and will happen all over West Europe and here in US because the existing political structures have become altogether useless at a time when the people most need them to be useful. Our very own Miss Le Pen likely crouches somewhere in America while the idiots of the press services ignore her, concentrating instead on concocted issues of no consequence while the people walk in dazed circles looking for their Saviour who is, not fast asleep, merely merrily watching and waiting.